The Singulair Green aerobic treatment system incorporates Norweco’s advanced aerobic treatment process, proven in hundreds of thousand of installations for decades, into a durable, watertight polyethylene tank. It is ideal for new or retrofit applications and can be installed easily in the most difficult jobsite with just a backhoe. Incorporating patent-pending support ribs and inherently strong arch shape, the durable Singulair Green tank will provide decades of reliable performance. 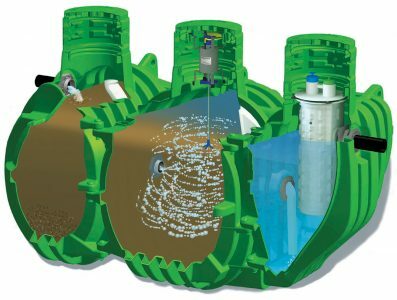 Single tank convenience; the Singulair Green contains pretreatment, aeration, clarification, filtration, flow equalization, optional disinfection and dechlorination all in one compact treatment unit. The need for additional treatment system tankage is eliminated saving time and money. Homeowners now have unlimited site options for their dream home. Designed for domestic wastewater flows up to 600 gallons per day, the Singulair Green treatment unit is certified to NSF Standard 40 and our Bio-Kinetic system is certified as a chlorine disinfection device to NSF Standard 46. Underwriters Laboratories (UL) and the Canadian Standards Association (CSA) have certified and/or listed all electro-mechanical equipment and components. These listings provide the highest safety, reliability and quality.